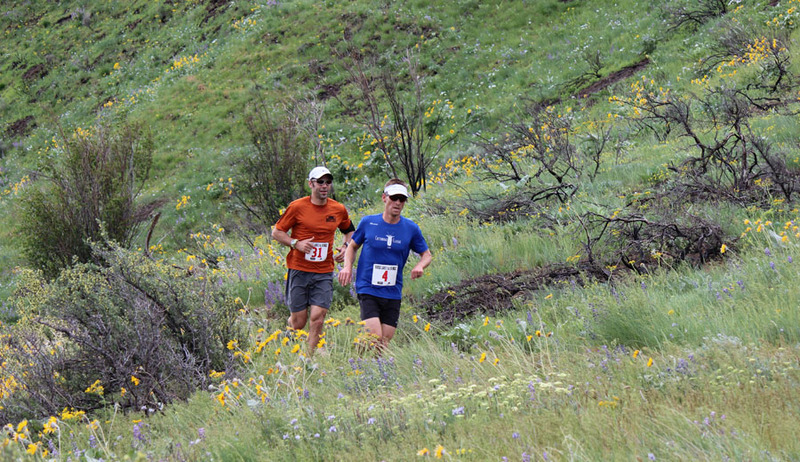 Chad McBride, right, and Andy Johnson, left, were the first to top elevation spot (2,400 feet) on the 10-mile course. Johnson went on to win the race. McBride finished third behind Will Young. 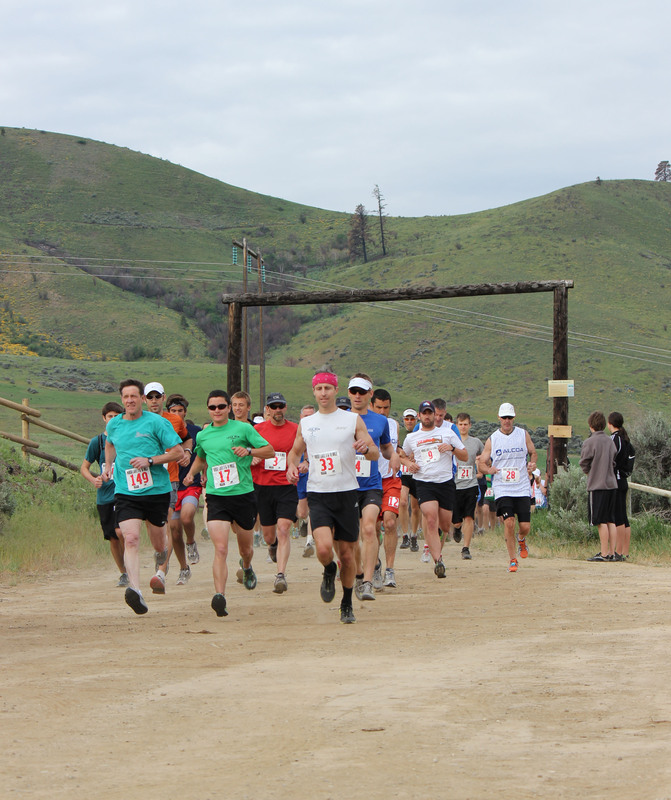 WENATCHEE — If the reaction from runners is an indication, Saturday’s Horse Lake Trail Run will not be the last. The inaugural event in the Wenatchee Foothills northwest of the city came off flawlessly and had participants clamoring for more. “You should do it every year. It’s perfect,” said Wenatchee’s Andy Johnson, who won the men’s 10-mile race. Runners charge out along the Horse Lake Reserve road moment after the start of Saturday's event. About 150 people signed up for either the 10-mile or 5-mile runs. The event was organized by RunWenatchee as a fundraiser for the Chelan-Douglas Land Trust’s Wenatchee Foothills Campaign. The recent heat wave in the Wenatchee Valley wasn’t a factor. Early morning cloud cover, a slight breeze and the higher elevation (1,750 feet at the start; 2,400 feet at the highest point) left temperatures ideal for the run. 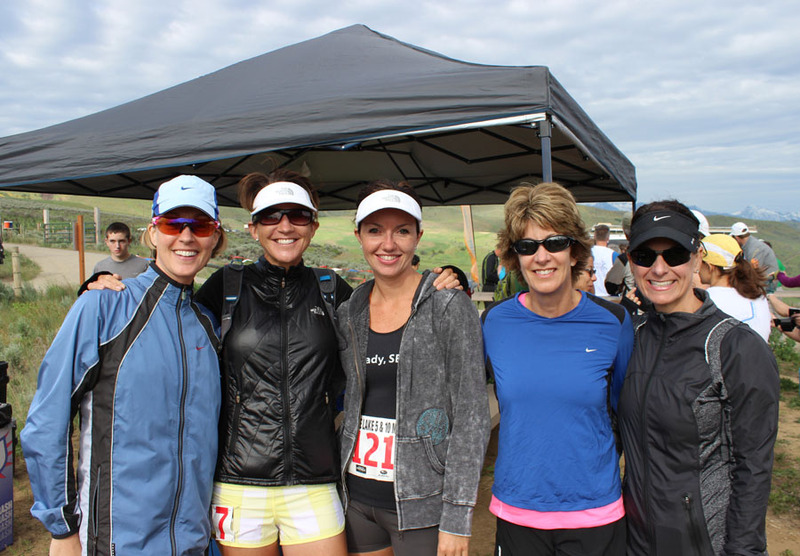 Many of those who participated — including runners from as far away as San Francisco, Bend and Bellingham, but also some from Wenatchee — had never been to the Horse Lake Reserve before. Megan Middleton and Mark Macias moved to Wenatchee just a week ago from Seattle — Megan for a position at Fibro Corp. and Mark for a position at Alcoa — and were amazed at Horse Lake’s sights and close proximity to the urban area. Johnson was in a tight race early with Wenatchee’s Chad McBride. Both crested the first hill climb in the loop course step for step. 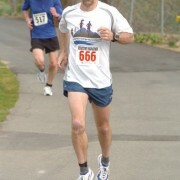 But Johnson had broken away by the 5-mile mark. McBride was eventually passed by Cashmere’s Will Young and finished third. Mike Broxson of Wenatchee was a close fourth. Johnson was clocked in 1 hour, 8 minutes and 22 seconds; Young in 1:10:47; McBride in 1:13:43; and Broxson in 1:14:. 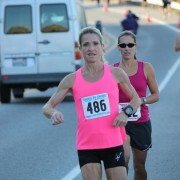 In the women’s 10-mile race, Seattle'[s Sibylle Wilbert placed first in a time of 1:36:50. Taking second was Kari Hall of East Wenatchee in 1:38:37. Wenatchee’s Jenn Vazquez-Bryan captured the women’s 5-mile race in 44 minutes and 44 seconds. Bellingham’s Angela Mischaikov was second in 45:57. Clayton Belmont took the men’s 5-mile run in 39:20, defeating Wenatchee’s Luke Hakensen, who was clocked in 39:41. By the end, as runners and spectators mingled around the refreshment tent, the talk was already about next year. Chelan-Douglas Land Trust executive director Bob Bugert said he was impressed with how flawlessly the event went off and credited RunWenatchee for its organizational and race course management skills. He also was appreciative of the shuttle service provided by the Mission Ridge Ski Team. 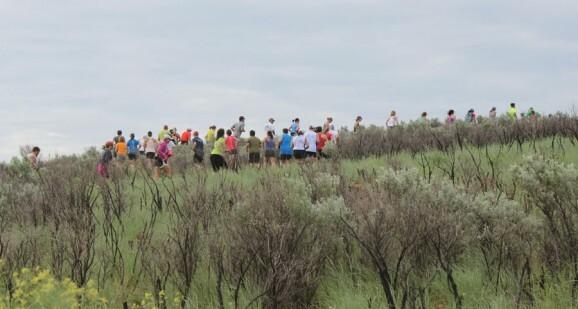 Nearly 70 runners used the van shuttle to get from the Wal-Mart parking lot to the trailhead, and then back later. “It was hard but I expected it to be,” said Susanne Cushman of East Wenatchee. Added Tacoma’s Elise Richman, “It was just awesome. I’m glad there are plans to do this again. We’ll be back for sure. 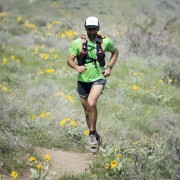 Note: Complete results will be posted later today or Monday at www.runwenatchee.com. Will Young, left, and Mike Broxson, right, near the top of the course on Saturday during the Horse Lake Trail Run. 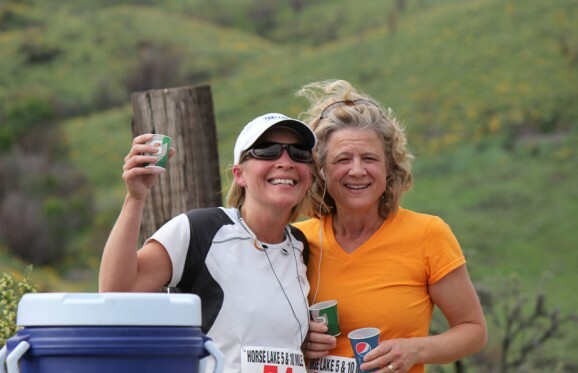 Nicole Brunner, left, and Joanne Thomas, take a break at the aid station at the 2,400-foot-elevation point on the course. Volunteers Charlie Naismith and Miranda Silvestre staffed the aid station. A group of Wenatchee friends — Jennifer Korfiatis, Jane Davis, Stephanie Cosina, Julie Christensen and Christina Cuevas Albert — pose before the start of the race. 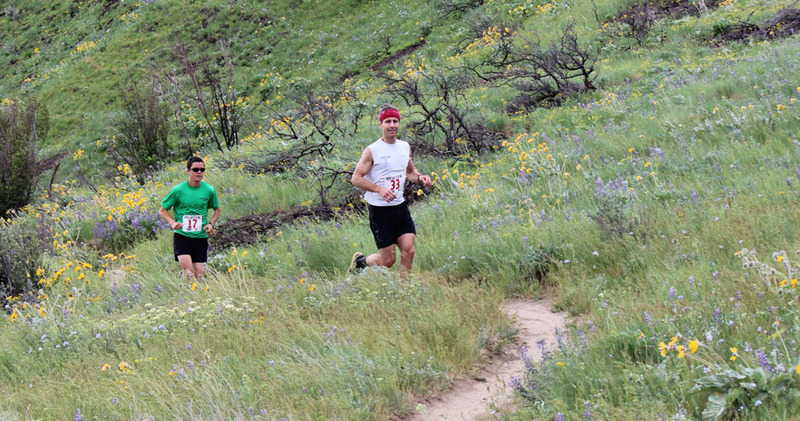 Runners heading along the trail shortly after the Horse Lake Trail Run's start on Saturday.